Rainfall drops 80 per cent. About 51 million people face water shortages in Yunnan, Guizhou, Guangxi, Sichuan and Chongqing. Food prices hit the roof as speculators horde production. The danger of street protests increases. 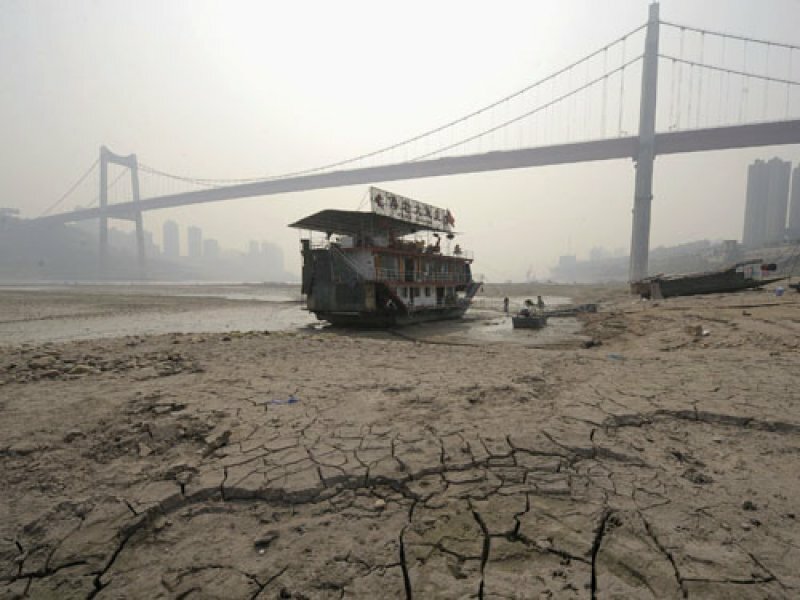 Beijing (AsiaNews/Agencies) – An unprecedented drought has hit southwestern China. Unusually high temperatures and dry conditions have cut rainfall by 80 per cent over last year in the provinces of Yunnan, Guizhou, Guangxi, Sichuan and Chongqing. Water shortages affect about 51 million people. Commodities like sugar cane, flowers, tea, fruit, rubber and coffee have taken a beating with output reduced by as much as 50 per cent. Given the situation, the authorities have begun to fear unrest and sent more than 10,000 armed police to the affected regions. Yunnan’s is the mainland’s second largest sugar producer after Guangxi, which also sustained severe losses in terms of sugar production, a year-on-year drop of 830,000 tonnes, or nearly 11 per cent. The decline in production will affect mostly domestic consumption. Little is exported since sugar cane does not usually yield high quality sugar. The quantity of flowers produced in Yunnan has plummeted as well, from one million to roughly 700,000 a day, but the price has risen some 50 per cent from last year. On average, the province sends about 14,000 roses to Hong Kong every day, and exports tens of thousands of flowers to overseas markets including Japan, Russia and Thailand. “A top-quality red rose, for instance, used to be sold at between one yuan and 1.5 yuan, but this year, prices range from 1.5 yuan to two yuan because of the drought," Hu Yang , of Yunnan Lidu Flower Development. The drought has also affected 200,000 hectares of tea plantations and destroyed more than 3,300 hectares of tea trees in Yunnan since last autumn. More than ten million Yunnan residents now face drinking water shortages; many areas have already been forced to get water far from home. Altogether more than 50 million people in the different provinces are affected by the drought, including more than three million in Guizhou who were facing actual food shortages. In some areas, high temperatures have led to wildfires, destroying large plantations. In Yunnan, drought is expected to wipe out more than half of the province's summer grain. In some areas, seven million people are facing grain shortages. The price of a 25kg bag of rice is now 105 yuan to 110 yuan while it only cost us about 75 to 80 yuan before. Now the authorities are concerned that food and water shortages and higher prices might set off protests by frustrated farmers, who have been hitherto exploited by the state. Rapid price hikes have led some to think that someone is speculating on food. Yunnan Communist Party Secretary Bai Enpei pledged to protect people from the drought, saying that he would ensure residents “a normal living”. He did not say how he would accomplish this. Just in case, more than 10,000 armed police have been dispatched to the five regions to “help” with relief efforts. The Central Meteorological Observatory in Beijing predicted that the drought would worsen, with no substantial rainfall expected for the next 10 days.